http://www.quickandeasywebbuilder.com • How to activate Quick and Easy Web Builder? How to activate Quick and Easy Web Builder? 99.9% of the activation problems are caused by a firewall or virus scanner which blocks the Internet connection to our web server! Please make sure the application has access to the Internet. Most firewalls/virusscanners have a safelist where you can manually add applications. Unfortunately we can not prevent your firewall/viruscanner from blocking the Internet connection, because it was designed to block any unknown Internet connections. So you must configure it the right way. Please double check your firewall/viruscanner settings! If your copy of Quick 'n Easy Web Builder is not yet activated it will show the 'Activation window' on startup. In the 'Registration E-Mail' field enter the email address you used to purchase the software. In the 'Serial Number' field enter the code you've received in the confirmation email for the reseller (esellerate, paypal). 3. Quick 'n Easy Web Builder will connect to the registration server and validate if the specified data is correct. I) Did you enter your registration name and serial number correctly? - Do not include extra characters like spaces or dots. - The input is case-sensitive. - For the registration name use the same email address as the one you used to make the purchase. II) Does your firewall block the internet connection? Make sure Quick 'n Easy Web Builder is not on the blacklist. III) Another common problem is that users still use an old version of Quick 'n Easy Web Builder. The license key you've received only works on the current version, not on previous versions. The information you have entered is invalid! Please try again. Double check if the entered data is correct. This license is already registered on another computer! Your license has already been activated on at least two other computers. You can activate 1 Quick 'n Easy Web Builder license on maximum 3 computers. This number will reset itself after some time, so normally you should not run into this problem. Already registered on for a different user! The first time you activate Quick 'n Easy Web Builder that email will be linked to the serial number you've received by email. 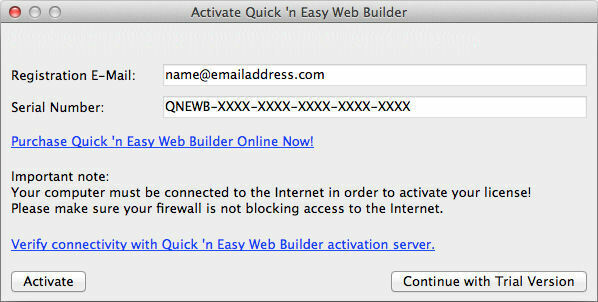 Make sure you use the same email address that you've used for the first activation of Quick 'n Easy Web Builder. Note that the registration information is case sensitive. If you do not remember the email address you've used the first time please contact us, so we can lookup the correct email address for you! An error occured while accessing the registration server. Please try again later. The registration server can not be reached. Are you still having problems activating the software? We are very confident that the registration information we've sent you is valid, so please read the information above carefully. Make sure you include all your order details and a detailed description of your problem. And please don't be rude, we will do our best to help you a.s.a.p. However it's very important that you use a reliable email address, so our reply will not end up in your spam! Did you check your firewall/virusscanner configuration?